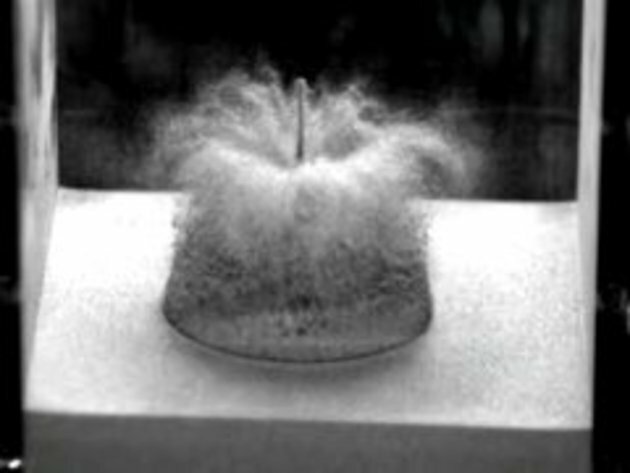 This is a slow motion video of a water droplet falling into extremely fine sand. The result is simply amazing! Remember, all "FIRST!" comments are considered to be SPAM, and are removed. @USAnumber1: I removed your two comments (before the one that's now #(removed comment)) comments since the links were screwed up. And you're probably right, to me it looks like a ball bearing, and not a water drop..
but its most likely a BB as there is no residue left on the sand and the impacting object disappears. And why does the sand falling back in the middle at 0:09 look wet and start sticking together? And when the drop touches the sand, you can see the rest of the water near the top. "Like sands through the hour glass, these are the slow motion videos of our lives"
#(removed comment) and #1: At 0:1 as the WATER droplet falls, you can see a tiny water droplet above the main one falling as well. Water droplet or mercury or something that can be poured and balls up. at 0:1 there are 2 drops (big fat one that impacts+smaller on following above) , but the drop ABOVE the large just disapears from 1 frame to the next. I don't know of any water/mercury that does THAT yet. This is tampered if not just faked. #6 that thing which seems to be a water droplet could actually be an optical illusion caused by light reflecting off of the ball bearings surface and into the camera lens. if you pause the video you can see multiple areas of concentrated reflection which could have created this. if you compare the second droplet/reflection to the color and texture of the metal ball and a real water droplet you can see that they are different. #3 that sticking together of the sand is probably created by natural static electricity at extremely small levels. if you look closely you can clearly see a faint trace of sand dust around the formations. this clearly indicates that the sand is dry. #7 i just read your post and it just enforces what i said about the second droplet really being a reflection. if you pay attention to the second drop/reflection you can see that it disappears as the ball bearing goes into the sand. its not a ball bearing!! its just a ball..
you can clearly see its not water, a drop of water is not Perfectly round. #9 i admit after watching it another 5-6 times, i see your point. What i don't understand is if the ball bearing/water drop (don't care, not important) made a reflection BEFORE it hit the sand, then why is there no light play/ shadow reflection from the sand itself AFTER the impact. The light looks like enough to do that much, if indeed it IS a reflection. #16 if you move the scroll bar back and forth you can see an extremely faint reflection particularly on the right and left sides of the rear glass. the fact that the reflection is minimal indicates that it might not be glass at all. i couldn't tell you what kind of material it is. the area of reflection on the metal ball indicates that the light source could be coming from the camera itself. also, if you look at the two side glass plates, you can see a major color difference. this indicates that the glass like material is reflecting light at a sharp angle. considering the fact that the sand is very fine, has a white reflective surface it is not too difficult to believe that light could reflect off of the inside of the container canceling out most shadows and reflections that the sand would cast under different circumstances. GradX, did that clear things up for you? #6 and #7....you're stupid. That's the *reflection* of the ball bearing...not a secondary smaller droplet...C'mon now. It's funny how slomotion can make a faling drop interesting. maybe it's not water or ball bearing but actually a UFO crash! lets see the debate for this theory.